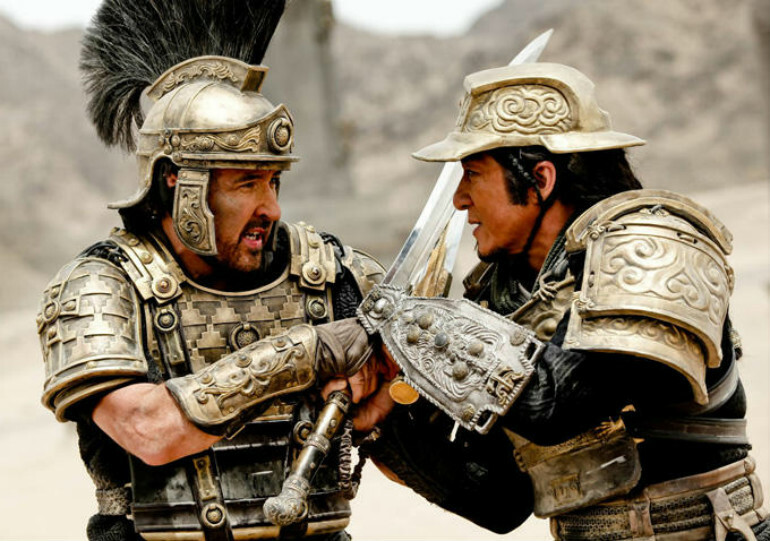 A historical epic with Jackie Chan, John Cusack and Adrian Brody, set along the Silk Road as a fugitive Roman legion encounters a Chinese security force, this was even worse than I imagined it would be. Let’s set aside the complete and utter ahistoricality of it all (despite the “based on real events” title card at the start), (OK, one point: it’s set in 48 BC, but all the Romans refer to themselves as being part of the Roman Empire: Julius Caesar was assassinated in 44 BC, and the Empire not really established until 27 BC, and even then it wasn’t called that for quite awhile later) or the simplistic naiveté of Jackie Chan’s vision of interracial harmony, the uplifting and apparently inevitable side effect of manly exercises like play-fighting and building stuff, and just focus on the action, which is ostensibly all one looks for in a Jackie Chan film. It’s pretty boring. Chan looks old and tired, the costuming pads him out (the better to absorb blows he would have taken bare-chested 30 years ago?) and slows him down. The choreography occasionally makes creative use of found objects, but that only reminds one of better scenes in other Chan films. The editing has the same peripatetic rhythm of 21st century wuxia, but with none of the surreal flair that CGI effects can give such films (Chan remains the most committed to actuality of his peers). Most absurdly though, director Daniel Lee continually frames Chan as an angelic figure, beaming beatifically on the men he has lectured and unified, awkward grin on his poorly-coiffed head (some things never change) as he is haloed by the backlighting sun. It makes one long to return to the striking image of a crucified, eyeless, John Cusack, if only out of a longing to take his place. Dragon Blade continues, somewhat surprisingly, at the Varsity Theatre.